How Dare You! might be a concept album about relationships, might be a pop album with artistic aspirations, an experimental album with pop sensibilities, etc. One thing’s for certain: it’s the last album from the original quartet, and thus the last album to feature the usual tug-of-war between Godley and Creme’s unpredictable artiness and the pop songwriting craft of Gouldman and Stewart. The album generated another pair of UK Top 10 hits – the ironically titled “Art for Art’s Sake” and “I’m Mandy Fly Me” — and continued to confound American listeners. 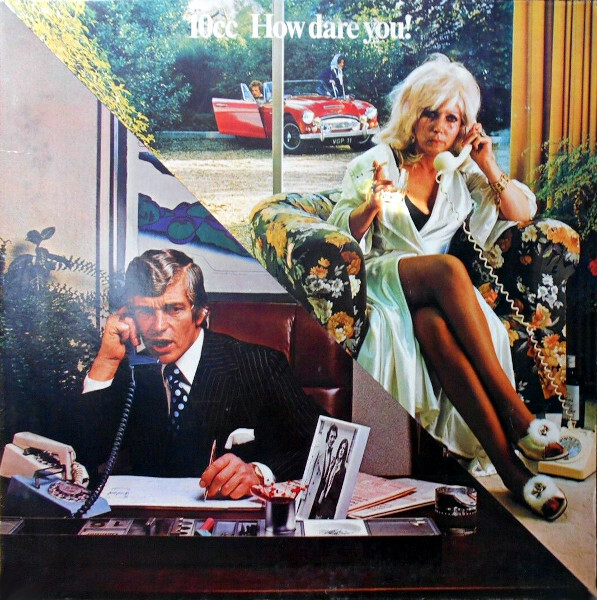 It’s not their most enduring work, but 10cc can produce good music even in an atmosphere of acrimonious auto-pilot. “Rock ‘n’ Roll Lullaby” is an adorable song about waking up Dad in the middle of the night, “Iceberg” and “Head Room” play with past musical idioms a la The Kinks, “I Wanna Rule the World” is interesting if a little demented. The trouble here is that the songs don’t pack a collective punch like Sheet Music; there are simply too many lulls in between all the good ideas (case in point: “Don’t Hang Up”), and either the momentum dissipates or the listener simply gets distracted. It’s obvious that a group with this much talent should have more to show for it than How Dare You! Lol and Kevin would continue to make music like this while experimenting with sonics on albums like L and Freeze Frame; Eric and Graham ironed out the weirdness (with wonderful results) on Deceptive Bends. 10cc was always an uneasy alliance of styles, but they left some good music behind them. Lol Creme (piano, clavinet, moog, organ, backup vocals, lead guitar, lead vocal, rhythm guitars, 12 string, maracas, sleigh bells, tambourine, vibes, gizmo, electric guitars, recorder, electric piano), Kevin Godley (drums, backup vocals, lead vocal, congas, timpani, cow bell, bongos, triangle, maracas, temple blocks, cabasa, castanets, hand claps), Graham Gouldman (bass, backup vocals, lead vocal, acoustic guitars, rizo-rizo, tambourine, zithers, double bass, six-string bass, electric guitars, cow bell, dobro, slide stel guitar, glockenspiel, Spanish guitar, hand claps), Eric Stewart (lead vocal, lead guitar, backup vocals, six string bass, piano, steel guitar, whistle, Levi zip, electric piano, fuzz bass, pedal steel guitar, slide guitars) with Mair Jones (harp on B4). Produced by 10cc; engineered and mixed by Eric Stewart. Sleeve design and photography by Hipgnosis. Sleeve design assistance and graphics by George Hardie. Photography by Howard Bartrop. Released on elpee, cassette and 8-track in March 1976 in the UK and Austria (Mercury, 9102 501), the US (Mercury, SRM/MCR4/MC8-1-1061), Japan (Mercury, RJ-7070) and the Netherlands (Mercury, 6310 501) with gatefold cover and lyrics innersleeve; reached #5 on the UK charts and #47 on the US charts. Re-issued on compact disc in 1989 in Europe (Mercury, 836 949-2) and Japan (Mercury, 23PD-115). Re-issued on compact disc on December 5, 1991 in Japan (Mercury, PHCR-6033). Re-released on remastered compact disc in 1998 in the UK and Germany (Mercury, 534 975). Re-packaged with The Original Soundtrack on 2-for-1 compact disc on March 30, 1999 in Russia (Mercury, 10CC-437). Re-released on expanded, remastered compact disc on February 18, 1998 in Japan (Mercury, PHCR-4418) with 1 bonus track. Re-released on expanded, remastered compact disc in 2001 in Japan (Mercury, UICY-9174) with 1 bonus track. Re-released on expanded super high material compact disc on February 20, 2013 in Japan (Mercury, UICY-25356) with 3 bonus tracks.